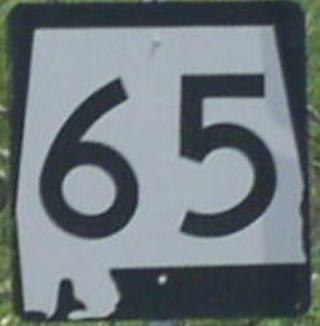 Alabama State Route 65 is a north-south highway in Jackson County. This runs along the Jackson/Madison County Line. This is the only county that it runs in. AL St Rt 65 passes through the following towns in Jackson County. AL St Rt 65 is not multi-plexed in Jackson County. AL St Rt 65 is multi-plexed in Jackson County. U.S. Rt. 72, near Paint Rock. Alabama State Route 146, at Swaim. Tennessee State Route 97, at the Alabama/Tennessee State Line. Junction sign on EB U.S. Rt. 72.